Sz 10.5 dress shoes / 11 sneakers. If the Imperial Army were looking for a new boot supplier for their Speeder Bike Storm Trooper Unit, no doubt, they would award Puma the contract. These boots look next level and are visually impressive. Fit and finish, construction in terms of the tolerances between the panels, how the seams meet, the overage of material after the stitching has Sidi beat. All the tolerances are tight and precise. Even the plastic both shiny and the matted surfaces are hard and seem to be a notch above as well as the choice of leather (or more likely synthetic pleather). The structural rigidity cannot be topped. Much of what looks like styling accents are actual reinforcement bodies, like the Puma logo along the side - that is a solid piece of plastic that runs from the forefoot to the back of the ankle joint where it meets the pivot for the Ghost Doctor ankle bracing. Sidi - 4 1/2 in. Sidi - 3 3/4 in. Puma - 4 1/2 in. With respect to the Pumas, after having a quick sit on the bike with them on you'll find that the heft of cage is mostly fore and aft of the boot and on the outer side where the buckle is located. The inner side is relatively clean and protrusion free. Puma was smart enough to incorporate a little recessed 3 in. x 1 1/4 in. rubber pad on the on the inner side of the exterior of the shin cuff in case is does rub against the inside of the motorcycle. After going through some riding forms - foot on footpegs in aggressive and normal riding positions, it yielded no perceivable clearance or rubbing issues - but under actual riding this may change. I'll have to report back. Note: I'm 5'10 "- 34" inseam and use stock footpegs and rearsets. The only thing I could think of to take marks off for was the toe slider screw recess design. The Pumas are metal (looks like Magnesium) while the Vertigos are what looks to be Delrin, however the screw heads on the Sidi's are set much deeper in their recesses. The Puma's are much shallower. One screw head is at the point of the toe slider and is probably only 1/8th in. from the surface of the slider itself. I know shearing down the head of the screw is something many track guys like to keep tabs on because the slider is a nightmare to remove and replace once the head is milled down. Both the Sidi and Pumas fit true to size - however the construction method of the Pumas make them feel a bit pinchy. With time I'm sure they will mold better to my foot and fit like a glove. The Sidis on the other hand have already broken in nicely but almost to the point where they have a little too much range of motion. Note: If you have a wide or fat foot, you probably will not like the Pumas. The rigid ankle bracing, heel cup, and lateral side protection running from heel to just before the fore foot are hard plastic and feel like they will never give or allow for much break in room. Taking them to get professionally stretched at a cobbler - based on what I see from the construction - may prove difficult. Noticing in hand that there was a difference between the two, I drug out my coke general purpose scale just to get an account for how much each boot weighs. Sidi < Puma by 3 lbs total. 3 lbs isn't going to make much a difference to 99% of us unless you're at the point where you are spending hundreds if not thousands trying to get weight off the bike and shave 10ths off your time. Putting on the Sidis is a straight forward affair. Zip the boot down from your calf to the forefoot, zip back up, close the velcro, and crank down on the calf tightening mechanism. With Sidi you're not as much putting them on as you are sidestepping into them. Puma has a completely different method. The inner sock liner is a continuous unit affixed to the boot that sits inside a rigid shell they term the Ghost Doctor. If you played any B-Ball in the 90's, you'll recognize the concept! It's from the Adidas EQT's Hoops sneakers ( a little German back biting nepotistic idea stealing there if you know the history of Puma and Adidas ), which in turn Nike sort of bit with the Air Huaraches. With the boot open, you grab the back finger loop, slip - or should I say push your foot down into the boot, then there's a drawstring quick lacing system hidden in the back side of the achilles heel protector which you yank up on which tightens the entire boot around the back of your foot, then you interlock the shin and calf protector, cinch the strap, buckle into the latch and you're done. Yup, no doubt about it it's definitely more involved than the Sidis. The back drawstring closure was a bit tricky at first to figure, but that was only maybe the first 1 or 2 times you put the boots on or take them off. The drawstring closure makes the boot fit more secure. Nice and snug, but comfortable. The ankle brace also is robust enough without prohibiting the range of motion for riding. What I did like over the Sidis is that there's no closer mechanism gimmicks or anything else to annoy me or break. I keep having a fear of that red turn-key or the release tab snapping off at some point. It just doesn't feel like very sturdy plastic and I can see on the first cold riding day this thing becoming fragile enough to snap if you forgot to let it warm up when you came in. Whereas as with the Sidis you feel almost as if you are wearing a pair of comfy Italian shoes or touring boots, in the Pumas there's no question that you just dropped your foot into a race boot. If you have ever worn a pair of Ski Boots, the isolating feeling will be remotely similar. They are not as restricting as Ski Boots (I tried doing the Michael Jackson "Smooth Criminal" Lean Forward Test and nearly fell on my face) but they definitely have less range of motion than the Sidis - which is a plus for our purposes. Another test I did was simply raising my feet off the ground, holding my legs out in front of me, and doing small circles in the air with my foot. With the Sidis there was no issue - it was just like I was doing them in a pair of basketball sneakers. With the Pumas however, like the Germans say: Nein! The Pumas basically lock your entire foot into a singular unit with the boot which means when you try to accomplish this move your whole lower foot and leg ends up moving. The one thing I did note while on the bike was the feel of the pegs and foot position. The Vertigo's sole is softer than the Puma's and provides more feedback thru the sole to your foot. The 1000's felt more isolated and numb almost like my Teknic touring boots. It maybe something you become accustomed to after awhile but I do have to give Sidi the high mark in this category. "Balls of your foot" placement or where you foot was exactly positioned was never a question. There is a drawback with all this though - the Sidi Vertigo's soles are notorious for how quickly they wear out. Wearing a hole thru the footpeg section in a year's worth of riding is not unheard of. If you walk in them they will wear thru even faster, so get comfortable with the fact that you will be resoling them what seems to be about every year or so if you are a pretty avid rider. Puma wins, period! The industrial designers and mechanical designers in behind this boot put a lot of thought into the form and function of this boot and it shows. Laterally, the Sidis leave a bit to be desired. I feel I shouldn't be able to roll my ankle too much in a Race oriented boot but the Vertigos have about as much roll and range as I do in my basketball sneakers. I will say that if I wanted a boot to walk around in and wear all day, the Sidis would be the one to go with. Very comfortable. The Pumas while having an acceptable range of motion for that sort of thing, you'll end doing a bit of the RoboCop walk. These are definitely not the boots you wear all day to run errands and chill out in. No way around it but the trade off is very well controlled ranges of motion. Beyond certain engineered flexibility points, they will not move! Again, think Ski Boot. It will keep your foot, ankle, and lower leg locked in as singular unit and you will have absolutely no ankle tweaking or twisting, but that doesn't mean it is not completely inflexible. The up and down range of motion is very good. It should give you all that you need before the Ghost Doctor system kicks and prevents any additional forward or rearward foot and ankle flex. I already mentioned above how your foot is encased in an exoskeleton like cage which is part of the Ghost Doctor system, well to me that's a big plus. My first motorcycle accident was a low side where my bike ended up slamming down on the side of my foot, trapping it and dragging me along with. Even though I had on full armored boots, the weight of the motorcycle jacked my foot up to the point I thought it was broken. With the Sidi's on, based on the way its armor panels are stitched onto the leather, I wouldn't expect any different. The Sidis provide excellent abrasion and initial impact protection but look as if they're lacking in the sustained impact force protection department. With the Puma's - hell - I could probably drop an anvil on them and I wouldn't feel a thing as the force would be spread across the entire cage systems as opposed to being concentrated in that one panel area. Last edited by Heist; August 11, 2011 at 11:52 PM..
Summer wear, got any cold weather reviews? I don't ride in cold weather. Once it gets into the 40's w/wind chill, I pretty much call it a wrap. The Vert Airs are perforated the Pumas are not - I don't even think they offer a perf version. In the 3 hours or so I had them on, just walking around watching the game, testing, and writing this - I felt no temperature change with my foot in the Sidis but my foot in the Puma was noticeably warmer. Factor in air movement while riding, and Puma is probably the much better boot in cold weather even though the Sidis have a vent on the side of the forefoot that you can shut to cut off air flow. Thanks for one thorough writeup on the webbikeworld level. Urban assault speakers - I like that. I use them for reference speakers when I'm playing around and working on music. Good review. The sidis u tested would be more suitable for the street. If you want something more comparable to the v2 u would have to step it up a notch on the sidis like the vortices. But for the price that's a good deal. Last edited by turkishexpress; November 3, 2010 at 10:14 PM.. True. Just wanted to baseline against the Verts since those seem to be very popular with people for both street/track. I haven't tried the Vortices yet, but they essentially look just like the Verts with two more mechanical tightners (Forefoot + Lower Shin) and a long vertical ankle brace. I find it interesting that more companies havent switched to the replaceable slider set up used by Teknic. Where the slider is attached from the bottom and not the side. Much harder to grind off the screws from the bottom of your foot. Nice review. You seem very bias to the Puma's from the beginning but good review nonetheless. I know a few people that have the Pumas and although they are great boots, its about the feel of the boot on your foot and the Pumas dont fit on every foot comfortably. Same as the Sidi's. Narrow foot will be fine in Pumas; wide feet not a chance. Range of motion will be a plus or minus depending on the rider also; I like the range of the Sidi's but dont like the restriction of the Puma's. The Puma's being almost twice as heavy didnt get much attention from you I see. It makes a huge difference to me. Good review. Agreed. That's one thing I liked about the Teknics when I was looking for a new set of boots. That no one else is doing this, it makes me wonder if Tek patented the idea or something. I have a set of their touring boots (i forget the model) and have been very satisfied but for one time when the heel cup of the sole unglued itself a bit from sole of the boot itself while I was walking. A little gorilla glue and no problems since. Does anyone happen to know where Teknic is made, btw? I can only find information for the US distributor. Yeah, it has always been hard for me to write in a neutral tone but I did give the Sidi's credit where credit was due. I know a few people that have the Pumas and although they are great boots, its about the feel of the boot on your foot and the Pumas dont fit on every foot comfortably. Same as the Sidi's. Narrow foot will be fine in Pumas; wide feet not a chance. I said the same. If you have a wide or fatty foot, forget looking at the Pumas. Huh? Did you miss the whole weigh-in section with pictures and a scale? The thing is M/C boots are not like track spikes or running sneakers. There is no overly pressing need to manage every ounce (although it helps); you're primarily wearing them while on the bike. There is no fatigue issue if that the concern. Cutting sprung mass, ok - legitimate issue but I'd take an extra few lbs in the name of increased protection. No, I did see you mention it, but it didnt "carry much weight" in the overall review. I cant recall the difference from trying on the Puma's but generally speaking, I'd prefer a lighter more nimble boot than the spaceboot feel of the heavier, bulkier feeling Puma. Even sacrificing a bit of extra protection. I must say they are attention getters though. The people that I know who ride in them get all kinds of questions since you dont see them often. One of them even wears mismatch colors (yellow, and black and yellow) since she has 2 pair and they get more attention than the bike she rides. Valid points. 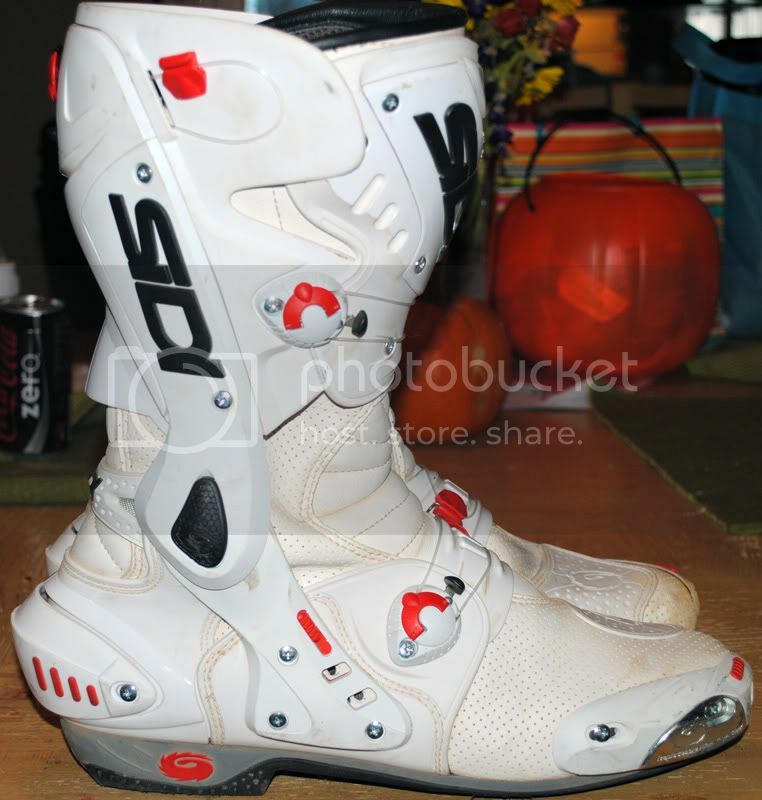 The Sidi's definitely feel more nimble and offer more feedback. I had them on yesterday as a matter of fact, just to see how they fit when my foot was hot and swollen - got distracted by a phone call - had them on for nearly the rest of the night, they just felt that comfortable.